There are some weeks where we only get one thing done, but it’s big and cool and exciting! The sort of weeks where we hit some huge milestone and have that “we can do it!” sort of accomplishment. But milestones are named as such because of how far apart they are. To get from point A to point B requires a whole bunch of little steps. Well, this week, we hit a lot of those smaller steps and put ourselves within striking distance of approaching milestones. It’s been a big week for Gears of Eden, so let’s get started! First off, the accomplishments of the art team! If you follow us on social media, you’ve probably seen our posts about upgrades to the main character’s model design. The most recent addition was the antenna. It certainly looks great, but it also has brought us so close to finishing the main character! All that we have remaining on this guy is the drill and possibly one other part (the spectrometer). Then, while things are being built out by our modeler and texture artist, we also have more concept art developing to help us figure out what our bases will look like! This is going to be a long discussion dealing with game design, aesthetics, and levels of modularity, but being able to look at concepts is prompting a lot of that already. By the time we’re at this stage of development, we’ll be ready for it. 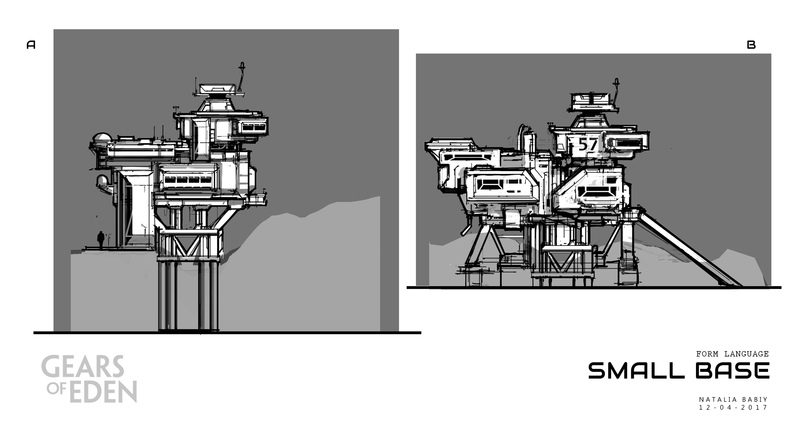 If you’d like to see more details on the evolution of bases in our concept art (and provide feedback), be on the lookout for a in-depth backer-exclusive post on our Patreon! Next up, we have the programming side of things! Honestly, this is probably the closest thing we have to a full-on milestone… the revamped UI systems! From a functional point of view, this is mostly finished. Our goal right now is to finish replacing old code with the newer stuff to make things run more smoothly and after that it’s just a matter of getting the UI assets in place to make sure it looks nice. The UI assets might be a while since they’re not critical to the functionality, but they’ll be in before the next official release! Finally, from a writing perspective, things are finally picking up steam! The first draft of the current short story has been finished! It’s an ugly little thing like any other first draft, but it lays the groundwork for a very fun story and, more importantly, very fun game elements! Where Story One described the societal class system of this world, Story Two features aspects of the game that we haven’t talked about before! There might even be a character or two in this story that you’ll be meeting in-game! This week has been packed full of new developments, and I have no doubt that next week will be just as exciting for us, so be sure to follow us on Twitter, Facebook, and Instagram for all the latest and greatest on Gears of Eden! Be sure to hit those like, share, and follow buttons to help let others know about us! Whether you’re looking for the latest Dev Update, our Reaching Eden Podcast, or sneaky little teaser about this game, our social media is the place to be! The only place better might be our Patreon, which features all sorts of extra content from behind the scenes! Thanks for sticking with us, and I hope to see you again next week!